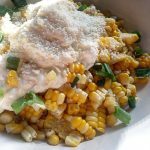 You are here: Home / Recipes by Category / Migas! Okay… now that we’ve got that out of the way, let’s talk for a minute. 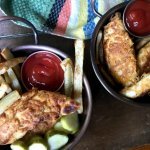 I’m finally dusting off this computer o’ mine after taking a break from blogging for a few weeks, and I’m coming back with a big ol’ bang of flavor! 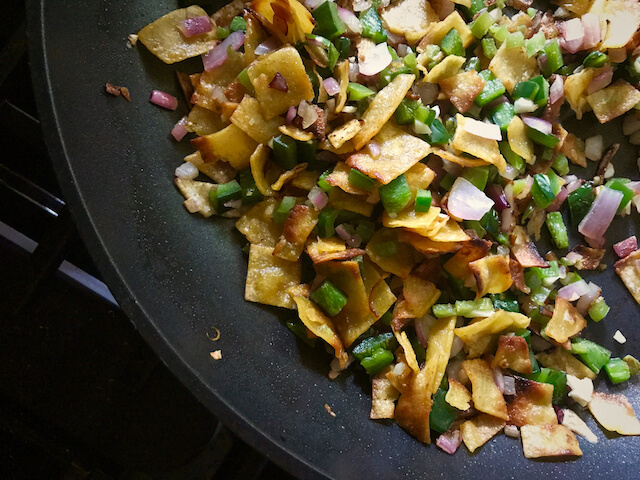 Because Migas, my friends… Migas. 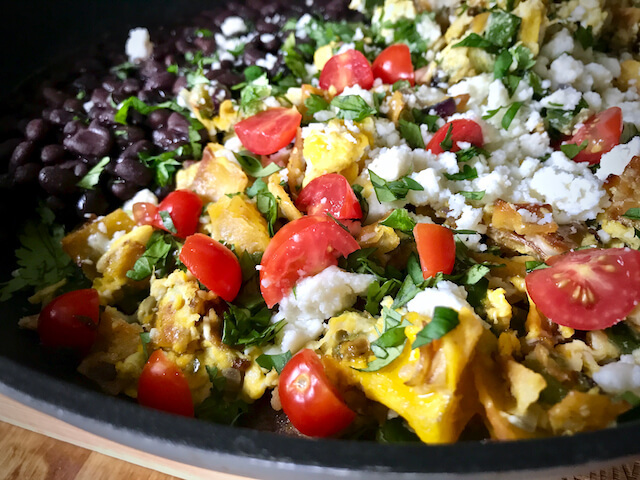 Every time I make Migas for breakfast or dinner Eric says, “what are they again?” and I reply, “They’re pretty much like Tex-Mex scrambled eggs.” I wasn’t entirely sure if that was completely accurate, but that’s how we’ve thought of the dish in my family. However, it turns out there’s much more to them than just scrambled eggs! 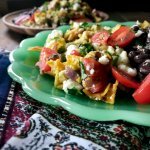 I did some research on Migas, and I found that there are a lot of versions of this fantastic little meal in places like Portugal, Spain, and Texas. And down in Mexico, there are differences depending on which region you’re in. 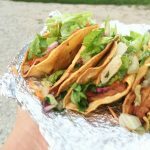 If ordered in Mexico City, you will end up with something substantially different than you’d get in other parts of the country… But I bet they’re all delicious! 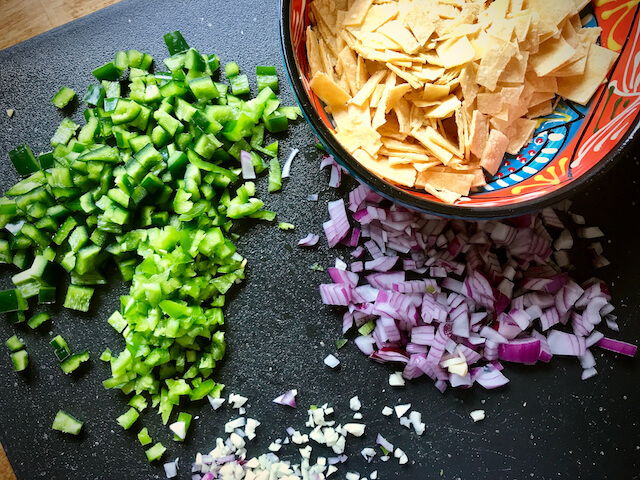 I do know for sure our family finds a lot of happiness in the bowls of the Migas I make. 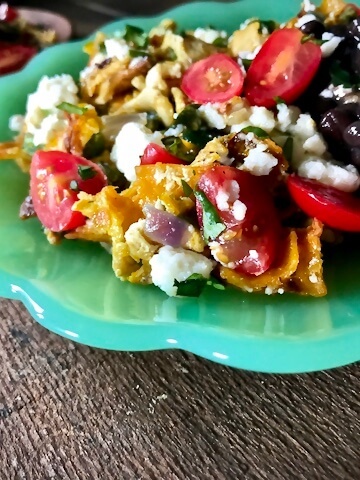 In my take on the Tex-Mex version, these babies are fully loaded with crispy tortillas, sautéed garlic, Jalapeños & Poblano peppers, onions, and finished off with a few slowly cooked eggs… and all of that is topped off with a generous amount of crumbled Queso Fresco, a handful of fresh cilantro, and juicy, chopped fresh tomatoes. Oh and just one more thing, there are some black beans involved, but they’re on the side. The entire meal is life changing. Drop dead delicious. It’s gonna make your taste buds do a lil dance! If I could, I would eat this glorious dish for every single meal for the rest of my life. 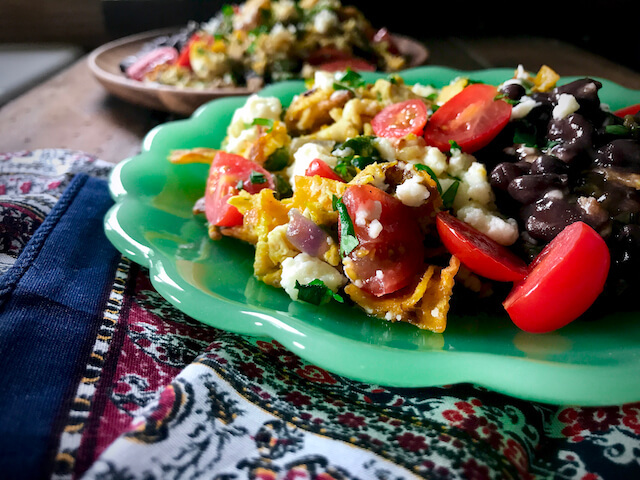 They’ve got a little crunch, loads of flavor, and are so easy to throw together on any day of the week (especially if you chop up your peppers and onions ahead of time, and keep’m in your fridge so they’re easy to grab on the days you want to make Migas!). 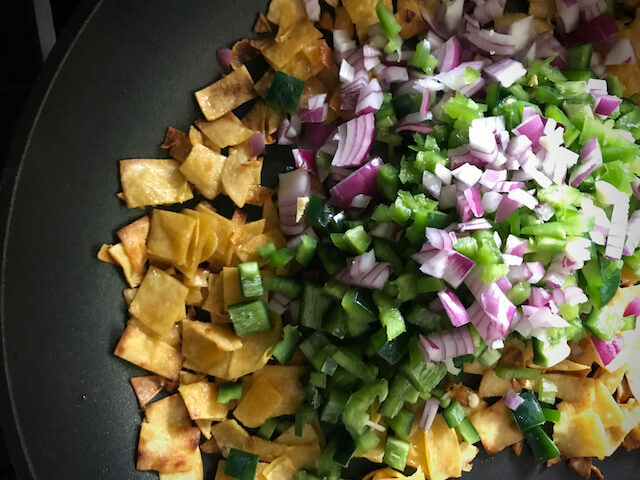 I think to make Migas, most people fry up chopped tortillas, throw in a few eggs, and then finish it off with at least a pound of cheese.. there might be some chorizo involved, but I decided to make them a little differently. And, of course, lighten’m up just enough for ya! You just need to limit the amount of oil and cheese that you’re using, and in so doing that, they actually end up being pretty healthy- you’re totally good to go. If you don’t give a lick about healthy eating, don’t push away a plate of these because they’re “Lightened Up”… trust me- the flavor is still out of this world. You’ll be like, “So, um, I thought you said these are supposed to healthy?” and that, my friends, is what I aim to do. If you have never had Migas, y’all, then this one if for you. 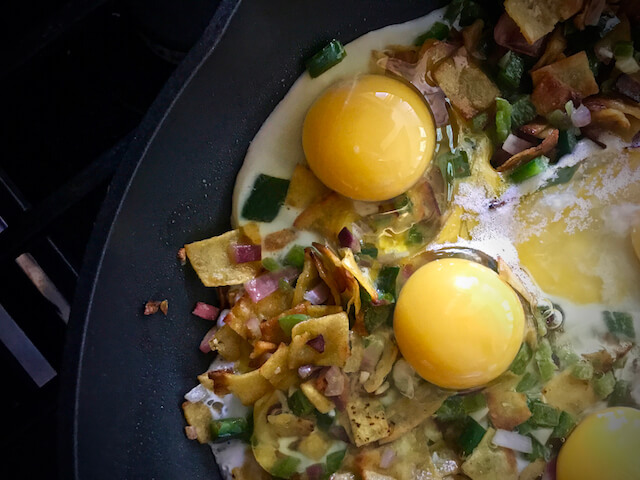 If you’ve had Migas, this one is for you. 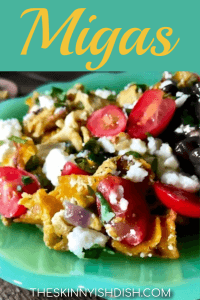 If you could live off of Migas every single day of your life, like me, this one is definitely for you. Let’s get into the kitchen, okay? Let’s start off with some corn tortillas! I’m going to show you a photo of the exact ones that I use. I grabbed the extra thin ones not only because they are less calories/points (if that’s your thing), but they seem to crisp up a bit better when using less oil. So if you can, use these guys! I can find’m at any of my local grocery stores with all the other tortillas, so you should be able to too! Okay. 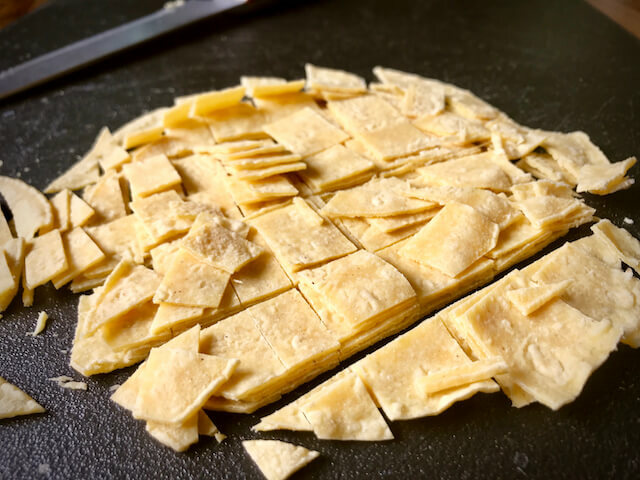 Chop those up into small strips and/or squares, they don’t need to be uniformly chopped. Now dice up one Poblano pepper (green bell pepper will work too), one Jalapeño (remove those seeds unless you like stuff to be EXTRA spicy), two cloves of garlic, and one small red onion. Set’m aside. Now add one tablespoon of olive oil to a nonstick pan. Heat over medium heat, and then add the chopped tortillas to the pan. because truthfully, these can go from brown to burnt in a hurry. Next turn down the heat just a bit, and we’re gonna add another half tablespoon of olive oil, along with all of our diced goodies. 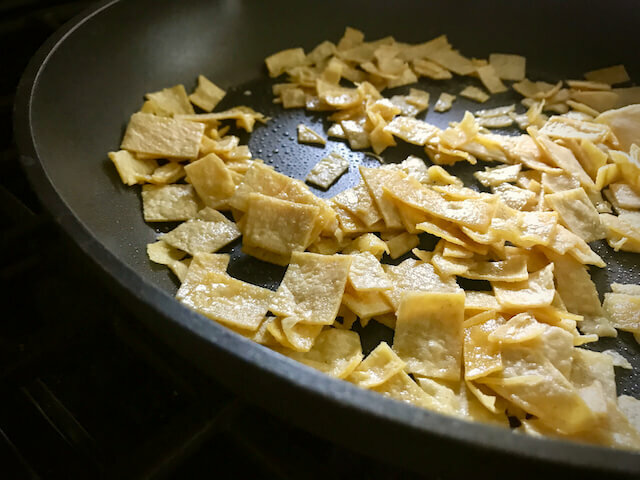 Stir’m into the crispy tortilla chips real good! How gorgeous are these colors? I just love’m! You’re gonna wanna continue to cook these over medium-low heat, stirring often, but not constantly. And here it is when the onions, peppers, and garlic are softened just enough. I really like when there’s the slightest bit of crunch to vegetables of any kind, so I stop cooking them a bit early. If you like’m a bit softer just keep’m cookin’ for an extra minute or two. Okay, now turn the heat down even a bit lower. 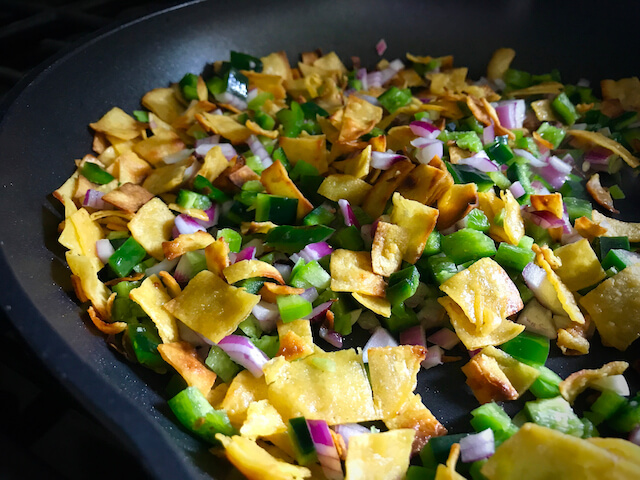 We need to spray a little bit of the cooking spray over the tortillas, peppers, and onions so that the eggs have just a lil somethin’ somethin’ to cook in, and make it easy for them to glide through the pan. A lil note: In dishes like this, I love to use Avocado cooking spray! It’s a serious favorite. Avocado oil has a high smoke point so it doesn’t give off a weird smell if you happen to be cooking it just a bit too high. 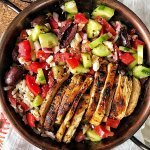 You can find Avocado oil cooking spray at probably any grocery store, either in the organic grocery section, or right with the other cooking sprays. 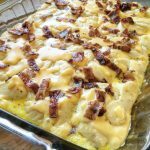 Now just move those eggs around with a spatula, gently fold the eggs into the mixture, and cook’m low and slow for a few minutes for the ultimate lil’ egg scramble. When the eggs are 93% cooked, go ahead and remove them from the stove. Let the residual heat from the pan finish cooking them, but not over-cooking them… because friends, over cooked eggs are just bad. Friends don’t let friends over-cook their eggs! 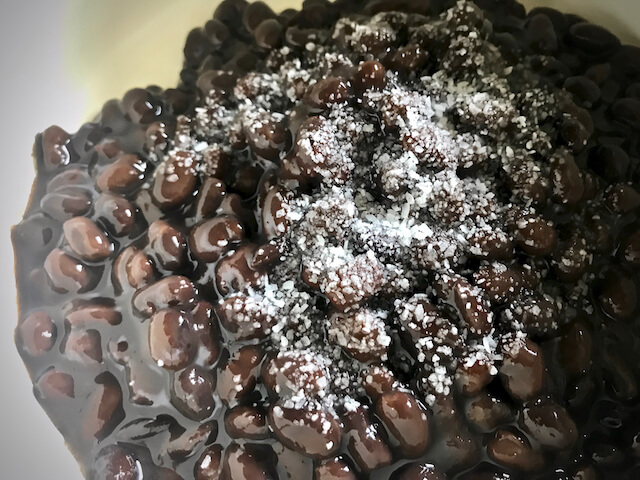 Now if you’re a fan of black beans, you’re really going to want to heat up some black beans in a small sauce pan on the side. I just use a single can, nothing too fancy. I normally add a bunch of spices to my beans, but the Migas alone are so very flavorful, all they really need is pinch or two of salt. (As you can see I used more than just a pinch or two, because I actually made a double batch of beans so there would be leftovers for tacos) You can heat these up before you even start making the Migas. 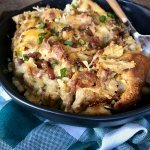 Let them simmer away while cooking, so you can easily throw them on the side for the ultimate breakfast, brunch, or brinner! And here they are, in all their glory! But wait- there’s just a lil more delicious that needs happen before we’re done. 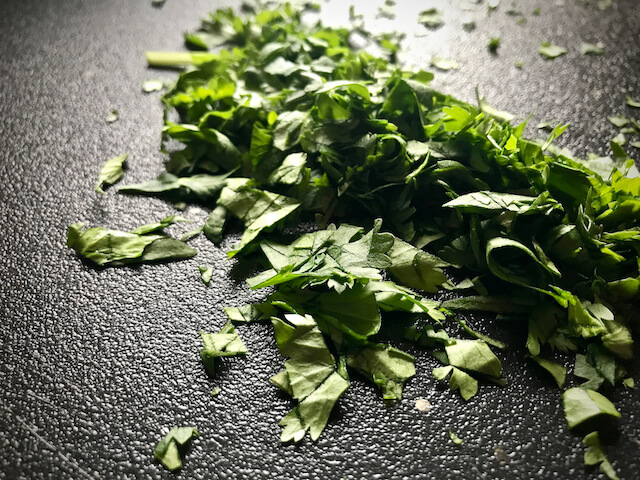 I know different people typically either love or hate this herb, it’s programmed in our DNA… so just disregard this. Anyway, try not to ignore this part, because it’s important. You’ll need to take some of this and crumble it all over for ultimate deliciousness. 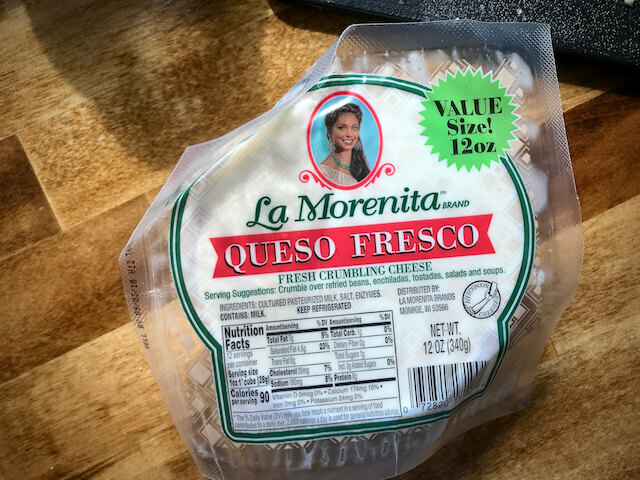 You can find Queso Fresco in the dairy section with other Mexican cheeses in your grocery store. If you can’t find this, you can use other cheese. But I’m really lovin’ this cheese lately, especially on top of these Migas! AND PRETTY! What more could we ever want out of plate of food? Make these soon friends, and let me know how it goes! 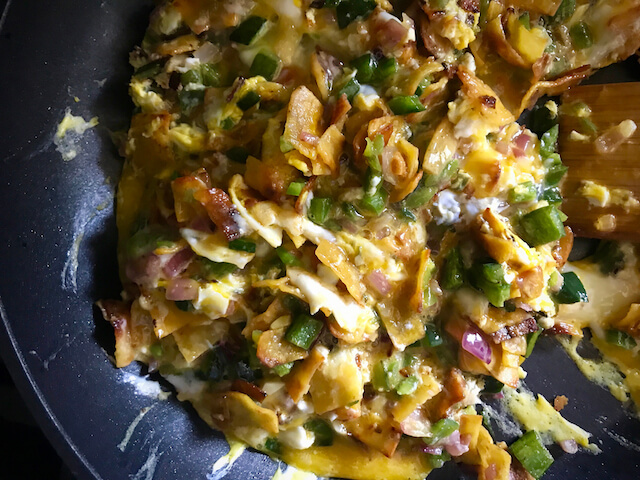 A tex-mex breakfast full of chopped and lightly fried tortillas, peppers, onions, eggs, tomatoes, and queso fresco. 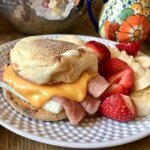 The perfect Breakfast, Brunch, or Brinner! When the tortillas are finished cooking, turn the heat down and add another half tbsp of olive oil followed by the peppers, onions, and garlic. Stir to combine, After a few minutes the onions and peppers should be softened, spray everything with a little bit of cooking spray and then add one egg at a time. Slowly folding the eggs into mixture and slowly cooking them. Season with salt to taste. 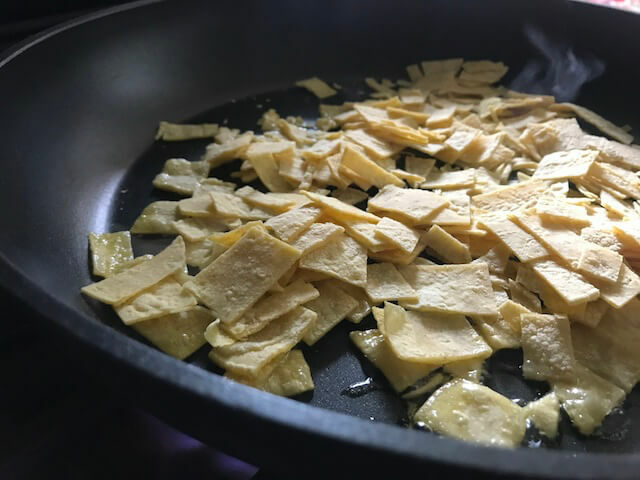 When the eggs are mostly done, remove the pan from the heat, and let them sit for a minute or two so the residual heat from the pan can finish cooking them to perfection. Add crumbled Queso Fresco, cilantro, and chopped tomatoes on top. 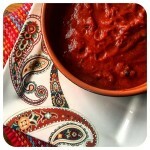 Serve with black beans for the perfect plate. 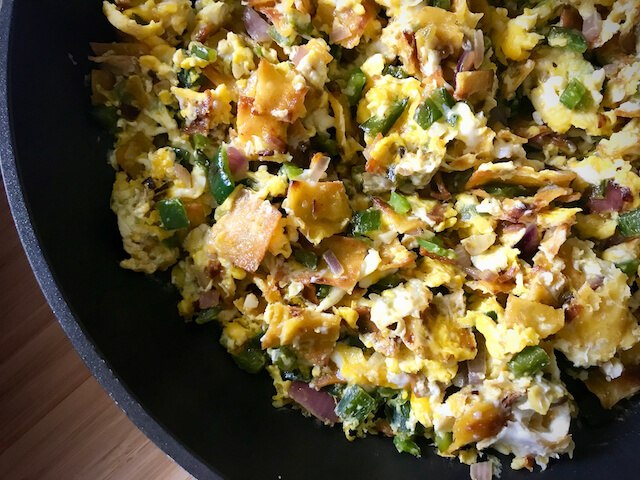 I fell in LOVE with Migas when visiting a friend in Austin, several years ago. I have looked and looked for recipes and none of them seem to come close to the ones I fell in love with. I have given up on searching for a recipe, and have stumbled across this one! This just might be dinner tonight! I’m so excited! Thank you!!! Oh, I hope you love it so much! I’ve never had Migas in Austin, but i’ve heard VERY good things. I hope these Migas do the trick. I love’m so much! omg this is going to be so goooood!!! 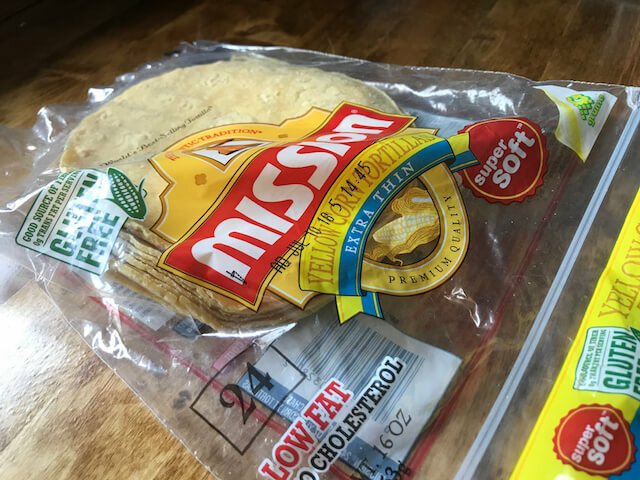 Have you ever saved these for later in the fridge to meal prep ahead of time or do you prefer them fresh? I can eat these Migas any way, any day ..including cold out of the tupperware container. Ha! 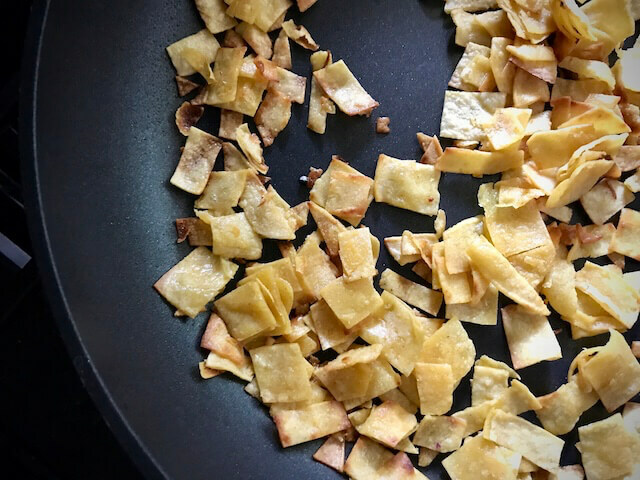 I will say they obviously shine much more fresh out of the pan because the corn tortillas do lose the yummy “crunch”, but it personally doesn’t bother me when I reheat them if they aren’t super crunchy. I hope you love’m! Does the calorie count include the beans? Thank you! I mean…. do you even have a bad recipe! This was unreal!!! 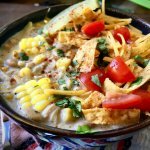 Are the Optional ingredients: Cilantro, Tomatoes, Can of Black Beans included in the Calories per Serving? Can you please advise the serving size? one heaping cup. 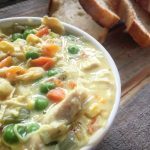 I always list the serving sizes in the note section of my recipes- Hope you enjoy!